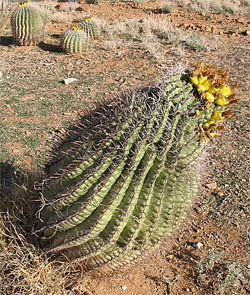 Dr. Bob Bosworth, a retired physician and fly fisherman living in Denver, CO, came across a Fish Hook Cactus in the southern deserts of Arizona thirty years ago and was inspired to clip off some of the sharp spines. He then created an inventive fly recipe that used the curved spines as hooks — and began catching fish. “George Montgomery, curator of botany at the Arizona Sonora Desert Museum, said spines from Ferocactus wislizenii, the plant’s scientific name, are similar to wood. ‘They’re rigid and solid,’ he said. ‘And they’re very hard. They’re like modified leaves. Just like most wood, it has a lighter specific gravity than water. '” Abby Lowell in the Juneau (Alaska) Empire. Thanks to readers Brad Elfers and Kurt Iverson for this link.